Abstract: Engineering materials for altering or improving their properties to offer a certain function is one of the most emergent arenas of nanotechnology. Many industries (e.g. drug delivery, imaging, tissue regeneration, energy storage/production, sensors, catalysis, so on) demand specific nanomaterials that offer desired solutions to a particular problem. Nanomaterials with desired function can be achieved by either tailoring various physicochemical characteristics in atomic level and/or manipulating the surface properties by interacting them with the functional moieties, biomolecules or other specific molecules during the synthesis or afterwards. 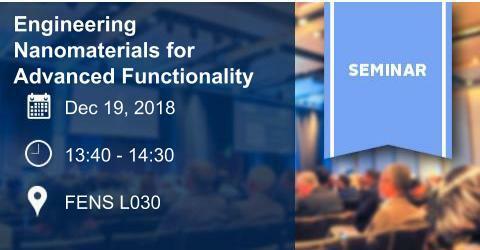 Here in, a collection of engineering strategies for designing nanomaterials that carry application specific functionality will be discussed by following a step-by-step approach: define the problem, solve the problem, and prove the current. Bio: Dr. Rükan Genç Altürk obtained her bachelor degree from Bioengineering (Ege University, Turkey) in 2005. In 2011, she received her Ph.D in Chemical and Process Engineering from Rovira i Virgili University (Spain). She pursued her postdoctoral research first in the Institute of Materials Science and Nanotechnology (UNAM), Bilkent University, and further at Chemistry Department of the Middle East Technical University. She is currently working as Associate Professor in the Chemical Engineering Department of Mersin University and leading the research group, Functional Nanomaterials Research Group (FUNGROUP), with ongoing national and international projects focused on the design of multifunctional nanomaterials for their use in many different areas including biomedical technologies, bio/chemical analysis, energy storage/production, and catalysis.